Have you ever tried opening [Settings] | [Passwords & Accounts] | [Website & App Passwords]? In order to access that screen, you will have to enter your screen lock passcode (or authenticate via the Touch ID or Face ID) even if the device is unlocked. On this screen, you’ll be able to interactively browse through the list of your stored passwords. The “interactive” part stands for the lack of proper exporting. In order to export a particular password, you’ll have to copy it to the clipboard or send it via AirDrop. There is no way to export more than one password at once. When browsing the passwords in iOS settings, you will quickly realize something is missing. Do you have Facebook or Twitter app installed on your iPhone? If you do, can you see your Facebook or Twitter password in the Settings? Unless you have used either password in Safari (e.g. for the purpose of single sign-on), you won’t see those passwords in iOS settings. This is simply because those types of passwords are not saved by their respective apps. The apps are using authentication tokens instead. For some reason, iOS does not allow viewing or editing Wi-Fi passwords. You can do that in macOS, though. 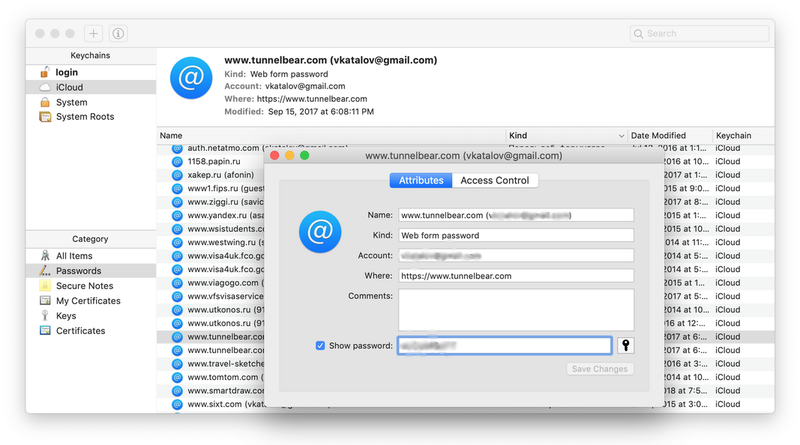 If you have a Mac in addition to an iPhone and your passwords are synced through iCloud (more on that later), you can use the built-in Keychain Access tool on the Mac. This tool also displays one item at a time, and you will have to enter the keychain password every time. Thankfully, on newer Macbooks you can use Touch ID instead of the password. Instead of manually browsing through the records and exporting passwords one by one, you can use Elcomsoft Phone Digger to extract all of them. You will need to copy the user’s and system keychain files from the Mac being analyzed. In order to decrypt the user keychain, you will require the user’s password. The system keychain is decrypted with a key file accessible with admin privileges. If you have access to the iPhone, you can create a password-protected iTunes backup. The “password-protected” part is absolutely mandatory. If you won’t set a password, or if you are analyzing an existing backup without a password, the keychain will not be accessible. 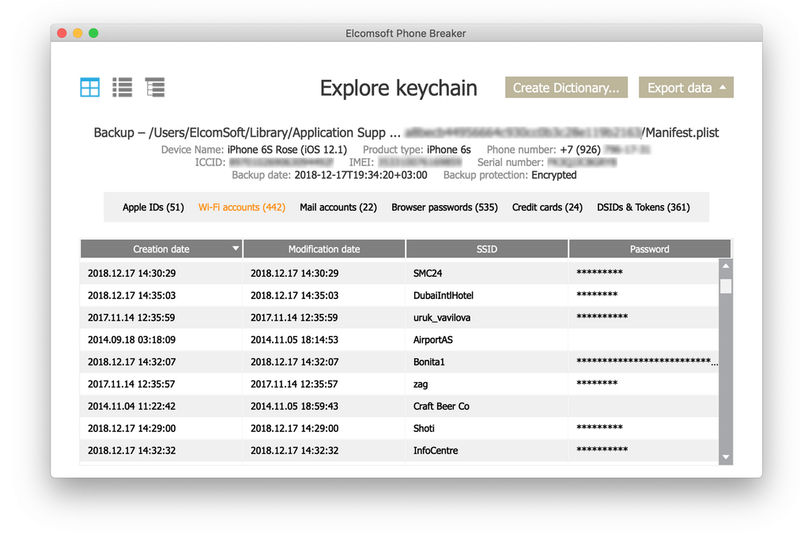 In order to view the keychain, load the backup into Elcomsoft Phone Breaker and use the [Explore keychain] feature. You can notice that many of the keychain items are not decrypted. This is because those keychain records have a higher protection class, and can be accessed only by the device they were created on (a hardware specific key is required to decrypt). This is not the only problem. If you don’t know the backup password for an existing backup, breaking it will not be easy. While we used to see recovery speeds of tens of thousands passwords per second for iOS 4-10.1, recent versions of iOS such as iOS 11 and 12 brought that number down to just about a hundred passwords per second with a powerful GPU. However, if you have the device itself and it is running iOS 11 or iOS 12, you can simply reset the backup password by using the “Reset All Settings” command. Note that this wipes Wi-Fi passwords but not the user’s passwords stored in the keychain. This is the dirtiest but the most powerful of all methods. If you have a device that can be jailbroken (at the time of this writing, jailbreaks exists for iOS versions up to and including iOS 11.3.1), you would be able to decrypt all keychain records including those with the highest protection class. Just use Elcomsoft iOS Forensic Toolkit. If you managed to install a jailbreak (this is not easy on some versions of iOS), the rest will be a matter of a few clicks. The GrayKey device by GrayShift allows extracting the keychain (as well as the copy of the file system) from non-jailbroken iPhones, but it costs $15K and is available only to select agencies in select countries (US, Canada, UK, Australia and New Zealand for now). It also works for a limited number of iOS versions (the compatibility list is kept secret for some reason). Since iOS 7, the keychain can be synced with other devices through iCloud. This is good news since iCloud extraction does not require access to the device itself. However, you will need the user’s Apple ID and password, as well as the one-time code from the second authentication factor (unless you are performing the extraction on an already trusted device). In addition, you will need the screen lock passcode or system password to one of the iOS or macOS devices enrolled into the “trusted circle”. Many keychain items are not synced to iCloud. Apple’s Set up iCloud Keychain article reads: “iCloud Keychain remembers things, so that you don’t have to. It auto-fills your information—like your Safari usernames and passwords, credit cards, Wi-Fi networks, and social log-ins—on any device that you approve”. Previous version of that article said that only the passwords are synced, which is not true; some applications (such as Facebook and LinkedIn at least) sync authentication tokens as well. The tokens are more difficult to use than passwords; you cannot use them manually to access the desired web site or application. However, they are somewhat superior to passwords as their use will allow you bypass the second authentication factor (if 2FA is used). 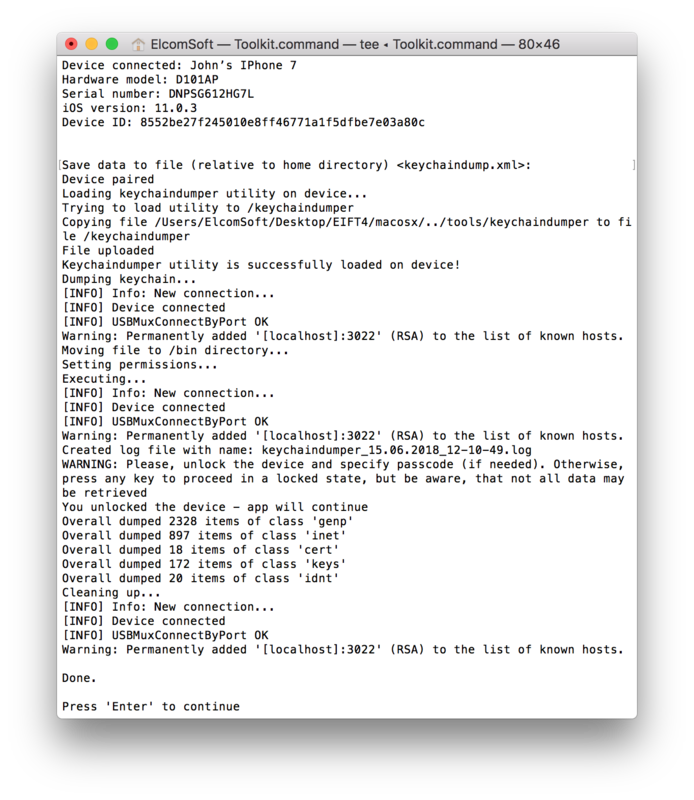 iCloud Keychain can be obtained with Elcomsoft Phone Breaker that you used to explore the local (iTunes) keychain. The downloaded keychain look just like the keychain from the iTunes backup. The number of records will be different as some records will be missing. In return, you may see a few extra records you did not see in the local backup. There can be many situations when you may need access to keychain data even if you are not working for the law enforcement. If you do, you know better how important this data can be. If you ever reset your device, this operation completely wipes the keychain without the chance of recovery. If you happened to have a single iTunes backup and forgot to set a password on it, you are out of luck. In this case, iCloud keychain may be your only hope if you had it enabled. If you reset network settings on your device, this deletes the Wi-Fi passwords. If you have a lot of saved networks, just make sure to save them in advance. It is worth adding a short note for our readers from the law enforcement. If you manage to extract the keychain, the next thing you may want to do is generating a wordlist/dictionary from the passwords discovered in the keychain. This wordlist will be extremely effective when attacking passwords to other data (documents, databases, or systems) of the device/account owner, especially if you use Distributed Password Recovery. Source: Elcomsoft Blog, author: Vladimir Katalov.